Maumenee is a kind of sweet wine stew with game meat, dates and nuts. It is a lot tastier than that sound. It works really well as a sauce for other game dishes. I think it can be made with any game meat. We used rook, the original recipe calls for chicken or hare. Mawmenee. Take a potell of wyne greke and ii poude of sugur; take and clarfye the sugur with a quantite of wyne & drawe it thurgh a strynour in to a pot of erhe. Take pynes with date and frye hem a litell in grece oþer in oyle and cast hem togydre. Take clowes & flour of canel hool and cast þerto. Take powdour gynger, canel, clowes, colour it with saundres a lytel yf hit be nede. Cast salt þerto, and lat it seeþ warly with a slowe fyre and not to thyk. Take brawn of capouns ysteysed oþer of feauntes teysed small and cast þerto. I will recommend using less sugar than the recipe calls for. I will post an updated recipe once I have tested it. We used powdour fort in addition to the spices listed – because we like it. But this is the recipe as it is in Middelaldermad, I added our variations in parentheses. I would also recommend making a half portion unless you are cooking for a lot of people as the portion is really big. 400 grams sugar use less than this - the wine mixture should be sweet but not overly so. Wine and sugar is heated though until the sugar is dissolved. Dissolve the rice flour in a bit of water (I used about half a cup) to prevent lumps and thicken the wine with the rice flour. Fry the dates and nuts in the olive oil and add it to the pot. Tie the whole spices into a piece of cloth or a tea bag and put them into the pot. Add the other spices. Color the stew with the sandalwood or the food coloring. You want it to stop being greyish. Let it simmer for a bit. Take up the spice bag (it is easier that way) and add in the raw meat. Let the stew simmer for 15 minutes until it reaches a sauce consistency. Source: The original recipe from 1390 from Forme of Cury. Form of Cure, originally from Curye in Inglysch, edited by C. B. Hieatt and S. Butler, London 1985). From Middelaldermad by Bi Skaarup & Henrik Jacobsen. There are many other transcriptions of this recipe, but this is the one I used. 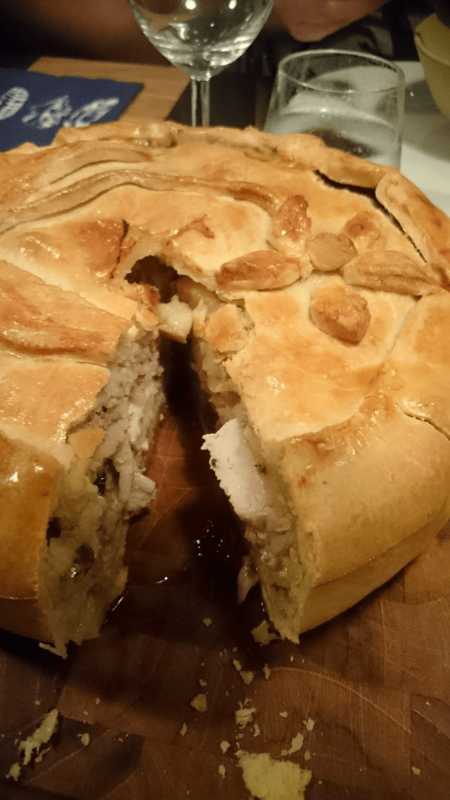 A wonderfully succulent medieval pie that is a perfect introduction of medieval cooking to modern dinners. The pie is made in a casing of my pie crust with a shortcrust lid. The filling is minced pork with fried chicken pieces and fruits dotted throughout.